The findings of contemporary single-institution series describing the most clinically significant experience with laparoscopic radical nephroureterectomy are listed in Table 1 and are stratified by type of laparoscopic approach. To date, no prospective randomized studies comparing conventional and hand-assisted laparoscopic radical nephroureterectomy have been performed. Retrospective studies have found that operative times for the conventional approach are longer than are those for the hand-assisted approach, that blood loss, narcotic use, and hospitalization are equivalent for the two approaches, but that convalescence is longer in those undergoing hand-assisted laparoscopic radical nephroureterectomy (29). Laparoscopic nephrectomy has been found to cost 21% less than open and hand-assisted laparoscopic nephrectomy, a finding that is likely applicable to laparoscopic radical nephroureterectomy (30). A hand-assisted approach for laparo-scopic radical nephroureterectomy may be cumbersome because the incision is often too high for adequate distal ureter and bladder dissection or too low for comfortable renal dissection, causing substantial ergonomic discomfort to the surgeon (27). Various rationales for the use of either the transperitoneal or retroperitoneal approach exist (31). Concerns regarding tumor spillage in the peritoneal cavity with the transperitoneal approach have not been documented in the literature, although this remains a real possibility. Transperitoneal laparoscopy has not been found to result in a significant incidence of postoperative ileus in comparison to retroperitoneal laparoscopy (Table 1). This is possibly because of the minimal bowel manipulation that occurs even with the transperitoneal laparoscopic approach. A randomized prospective trial of laparoscopic transperitoneal versus retroperitoneal radical nephrectomy identified only a faster operative time and easier control of the renal vessels as advantages of the retroperitoneal approach, and no difference in the rates of postoperative ileus (32). The hand-assisted retroperitoneal approach is relatively novel and unlikely to become widely used. Experience with this operation remains limited to a few institutions in Asia. Laparoscopic radical nephroureterectomy has been found to be marginally (6%) more economically efficient than open nephroureterectomy at centers where laparoscopy is routinely performed (33). With the continued decline in operative times and reduced reliance on disposable equipment, the cost of laparoscopic radical nephroureterectomy will continue to decrease. Abbreviations: OR, operating room; EBL, estimated blood loss; LOS, length of hospital stay. Source: Modified from Ref. 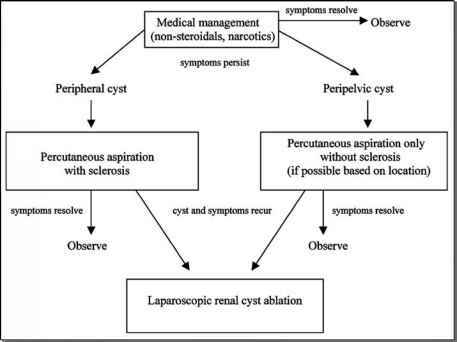 28.
perioperative outcomes, regardless of the type of laparoscopic approach used for the nephrectomy portion of the procedure.